(Newser) – A 14-year-old Hawaiian land snail born in an effort to save its species has died as the last of its kind. The Achatinella apexfulva named George died in a state lab on New Year's Day, likely of old age, NPR reports. 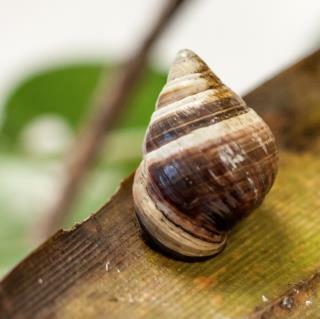 The first of some 750 species of Hawaiian land snails to be described in Western scientific literature, Achatinella apexfulva was mentioned as early as the 1780s by a British ship captain who received a shell on a lei. Then found hanging from trees in giant clusters, per the Guardian, the species had dwindled to just 10 known specimens by 1997, when a breeding program was launched. One of several offspring born of the effort, George—a hermaphrodite named after the last Pinta Island Galapagos tortoise—seemed bent on ignoring a world ill-suited for him. As wildlife biologist David Sischo tells NPR, "I very rarely saw him outside of his shell." In 1997 I wrote and illustrated a poem about Achatinella and its challenge to remain extant. It begins, "Once there was a little snail who wished that he would get some mail (nowadays should have said "they" for a snail who is hermaphrodite); he'd lived for years in one small tree, as lonely as a snail could be.............There are multiple verses, showing fires and non-indigenous species threatening tiny Achatinella, and a little girl creating a small oasis for the snails to save them from extinction. I certainly hope scientists can clone the little guy/gal. A New Years' resolution for someone. Thanks for getting Achatinella in the news. My little book was featured once at an exhibition---long time ago. As you know, they are multi-colored and quite lovely and fascinating I understand a similar creature is or was living in Florida. Good luck, Achatinella. May you be reborn!! !